A Malagasy banknote issued by the Central Bank of Madagascar. 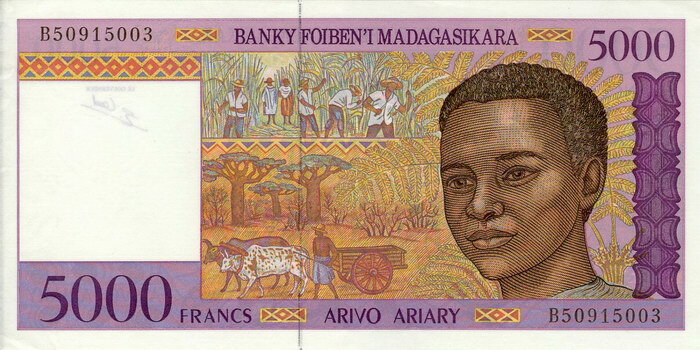 On the front of this 5000 Franc note is a picture of a Malagasy boy. In the background men work in the fields and a zebu cart passes a group of baobabs. On the reverse are several Malagasy animals including Ringtailed Lemurs (Lemur catta), a Red Ruffed Lemur (Varecia rubra), Comet Moths (Argema mittrei), Verreaux's Sifakas (Propithecus verreauxi), Madagascar Red Fodys (Foudia madagascariensis), a Helmet Vanga (Euryceros prevostii), and Madagascar Pygmy Kingfishers (Ispidina madagascariensis).